today i started PROJECT HELLO KITTY CUPCAKES. i have until september 17 to make 4 dozen cupcakes with fondant hello kitty heads. i spent the first part of my day off trying to get out of bed so i could hit up the dangerous store that is michael’s. someone in the house thought that my icing bag and metal cupcake frosting tip were disposable, so i had to buy new ones. 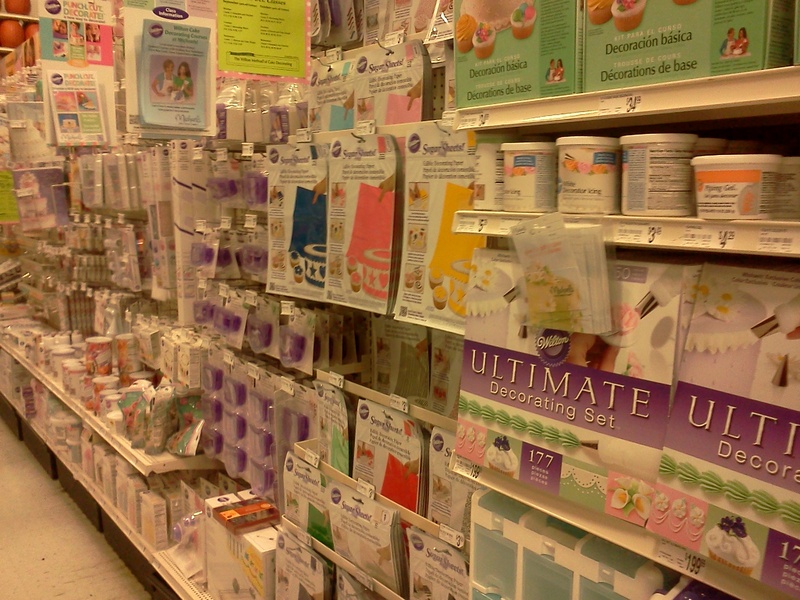 this is always the first aisle i go to when i am in michael’s…whether or not i need baking supplies. i just want one of everything that wilton produces. maybe in the future i will start buying duff’s products. i’m not all about to go “ace of cakes” on everything just yet. that’s way too much fondant for me to want to deal with. 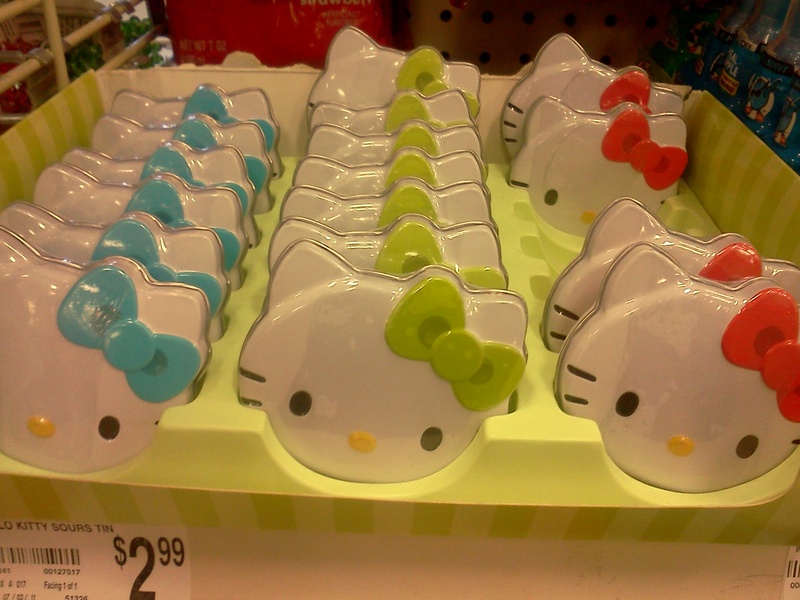 as i was checking out, i bumped into some little hello kitty tin heads. adorbs. but they didn’t have purple bows. when i walked out of michael’s, i had the urge to swing by DSW to look at some shoes…you know, because it was right next door…but i looked at the time (it was 5:45 p.m.) and i knew that if i walked in, the sales associates would hate me for being another customer that walks in right before closing. i hate doing that. and i can’t be in a DSW for 15 minutes. it doesn’t make sense. i just wanted to look at some shoes…not buy them…maybe. i sat in my car for 5 minutes, convincing myself to just drive home, and then i left. when i pulled out in front of DSW, i noticed 5 ladies all walking in. i’m sure the sales associates loved that. i got home with my supplies from michael’s and my free box of ritz crackerfuls from CVS. i’m loving these CVS coupons that give me free candy and snacks! i was not pleased with my first hello kitty head. i couldn’t find my exacto knife so i had to cut the fondant with a parer knife. i don’t even like cutting fondant immediately after i roll it out because it’s still sticky. i prefer letting it sit to dry up a bit so my edges can be cleaner. i had my sister print out a picture so i could use it as a guide. i used mini m&ms for the eyes and the nose. i’m still not sure if i like the bow or not. i’m tempted to use a flower cut out because the bride and groom are getting married in the bahamas. i figure a flower would be more tropical. any thoughts? as far as the whiskers, i used black icing…and you can definitely tell that i can’t pipe LEFT HANDED! this first try is going in the trash. my nephew always wants to help me so bad, but he ends up giving me a headache. it’s my fault. every time i start something, i ask, “wanna help me with this, punkin?” and after about 10 minutes it turns into, “DON’T TOUCH THAT! I SAID….DON’T. TOUCH. THAT!” he wanted to jam the mini m&ms into my white rolled out fondant. he wanted to take a flower cutout and press it into my white rolled out fondant. he wanted to, and did, press his fingers into my white rolled out fondant. i can’t ever have my back turned to him when i’m working with cupcake decorations. it ends up being a hot mess. in my third attempt, i shortened the whiskers. and i’m still unsure about that bow. i’ll try a flower cutout tomorrow. i made sure to separate the yellow and brown m&ms from the other colors in case my nephew got into the m&ms containers…but i obviously forgot that he doesn’t even like chocolate. how did we get this lucky? sometime this week i need to make cupcakes for the tellers at chase bank. they’re such a fun group of people. i was thinking of making the blue logo out of fondant and surprising them with it. we’ll see. i don’t like talking about something i want to do and not following through with it. i feel as if i should have had some cool introduction to my first blog post, but i figured that i should just get straight to the point and act like i’ve been blogging for years. besides, this is kinda how my blogs are going to be moving forward…so here you go. 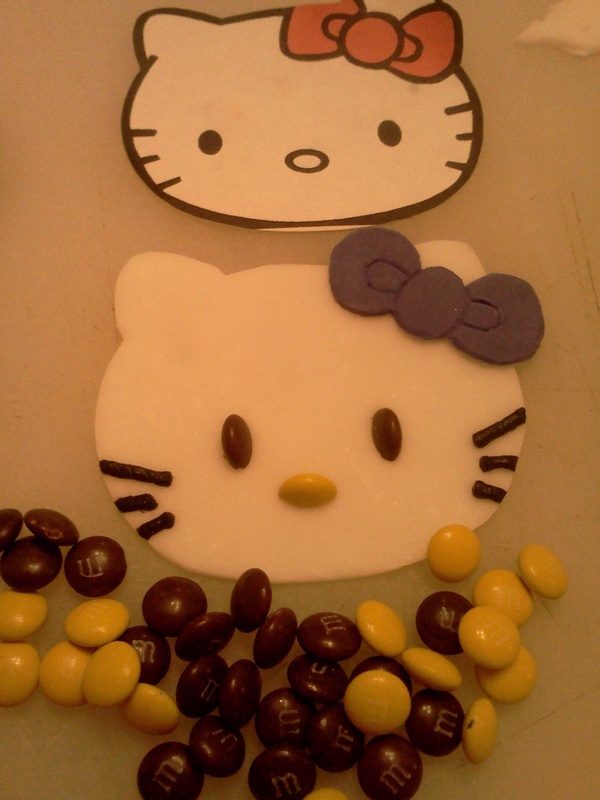 This entry was posted in baking, cupcakes, hello kitty and tagged hello kitty. Bookmark the permalink. Awesome! 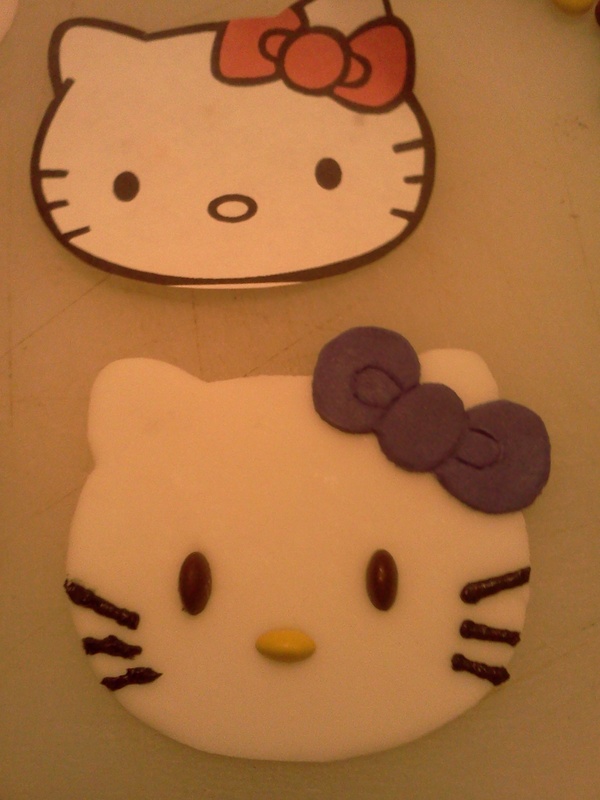 love the hello kitty fondant. 🙂 Great job! Cupcakes and Hello Kitty…I think we shall get along famously! They look great…I liked the first ones even if the whiskers were a little longer.